Schlock-Wire: Full Specs For Severin’s DVD/Blu-Ray Release Of SANTA SANGRE – Schlockmania! New York, NY (December 10, 2010) – The term “cult director” applies to no one more than Chilean-born filmmaker and visionary shaman Alejandro Jodorowsky. 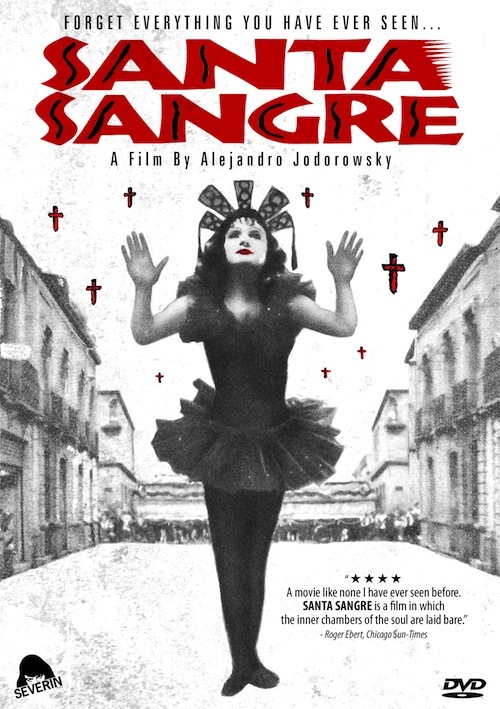 Now Jodorowsky’s long-unseen masterpiece SANTA SANGRE will make its eagerly anticipated American Blu-ray and DVD debut on January 25, 2011, from Severin Films via MPI Media Group. The internationally acclaimed tale of madness, passion and redemption will be fully retored and accompanied by a wealth of extras, carrying an SRP of $29.98 on DVD and $34.98 on Blu-Ray. Jodorowsky exploded onto the international scene with his notorious 1970s sensations El Topo and Holy Mountain. Endorsed by John Lennon and embraced by underground culture worldwide, the films redefined movies as both art and entertainment while single-handedly creating the midnight movie genre. Legal frustrations with the films’ owner (and Beatles manager) Allen Klein, as well as a failed attempt to direct a 14-hour movie adaptation of Dune starring Orson Welles and Salvador Dali, kept Jodorowsky from making movies for 16 years until his triumphant return with SANTA SANGRE. Blanca Guerra, Guy Stockwell and the filmmaker’s sons Axel and Adan Jodorowsky star in this surreal epic about a young circus performer, the crime of passion that shatters his soul and the macabre journey back to the world of his armless mother and deaf-mute lover. FORGET EVERYTHING YOU HAVE EVER SEEN: THE WORLD OF SANTA SANGRE (90MINS): Exclusive Feature Length Making-of Documentary Featuring All-New Interviews with Cast and Crew. Severin Films, founded in 2006 with offices in Los Angeles, New York and London, has been called “well on its way to becoming the greatest indie label of all time” by BlogCritics.org. Their DVD and Blu-ray releases include Enzo Castellari’s original Inglorious Bastards, the unrated Director’s Cut of Just Jaeckin’s Gwendoline, Richard Stanley’s restored Hardware, Goya Award winner Jess Franco’s Macumba Sexual and Bloody Moon and Oscar-nominee Patrice Leconte’s The Hairdresser’s Husband. Severin hit mainstream headlines all over the globe in 2010 with the theatrical release of the incomparable Birdemic: Shock & Terror.